Choosing between different models and sizes of steamers should be based on the amount of food you plan to cook within the cavity at once. In addition, you’ll need to consider the space accommodations allotted for your steamer, as one model may consume a footprint within your kitchen while another can sit comfortably on top of a shelving unit. Best for sandwiches, small volume outputs (like side dishes), reconstituting foods. These can generally hold between 3-6 pans and don’t consume floor space in your kitchen. Many can be stacked if a second unit is required. Best for small kitchens, small volume outputs, front of the house. Floor models consume floor space in your kitchen but can handle a larger output. They’re usually able to hold between 6-16 full-size pans. Some have over-powered boilers that can also power another piece of equipment like a kettle. Best for a large kitchen, large volume outputs, larger items for steaming like turkey breasts. Pros: can be installed virtually anywhere there’s an electric and water hookup and may not need a hood vent (check local regulations). Cons: may not get the boiler to steam as quickly as gas models. Steam units all utilize steam to cook the food within the cavity, but how that steam is created can differ based on the steam generation type you choose. These stand-alone steam generators are purchased in addition to your steamer and create steam which is then directed into the steamer unit. 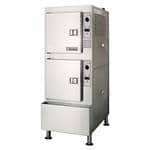 Best for restaurants without a boiler, when water isn’t potable, large operations with multiple steamers or other steam-based equipment. These steamers generate their own steam, nullifying the need for an additional steam generator. Boilerless steamers don't contain an enclosed boiler but rather utilizes an open water reservoir at the bottom of the unit or a spritzer which splashes cold water around the inside of the unit to create steam. The result is “wetter” steam but with the benefits of easy cleanup. Remember that your foods won’t cook as fast and may not be as crisp as with other units. Best for those without an external steam generator and easier to clean and service. With an enclosed boiler, these units create their own steam and then funnel it into the cavity. You will need clean, pure water because of the risk of limescale buildup (and costly maintenance). Items typically cook faster than equivalent convection steamers. Best for large volume outputs, starchy or tough foods (like potatoes and meat). Along the same lines as to how the steam is created is how that steam heats the food. There are two types of steamer cooking methods: convection and pressure. Utilizes a fan to circulate heat under normal cooking pressures. The result is a lower cooking temperature (because there’s no pressure to create the extra heat). These steamers have a tight seal which increases the temperature in the cavity to cook with a combination of high heat and steam. Typical cabinet temperatures can get between 230 and 240 degrees Fahrenheit. Many view steamers as a cooking tool for vegetables, but the fact of the matter is that they’re ideal for vegetables as well as seafood and other tougher items. The benefits of nutrient and moisture preservation combined with fast cooking times make it a prized niche product for many commercial kitchens. The water quality of the incoming steam should be of top priority, as limescale buildup can wreak havoc on your system. 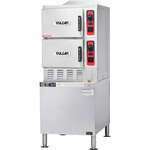 At the same time, poor water quality can impact the flavors of the foods in the steamer unit. Investing in a water filter is essential to your steamer purchase.